My dear friend, Christina Rose, ask that I paint a mandala for her and gave no specific direction. She simply trusted in my vision. Of course, I wanted there to be a rose to be at the center. At first, I began work on a very different, peach rose but after wrestling with that for a time I realized it just wasn’t working. I let go of my resistance and was guided intuitively to go in a different direction. Over the years, I have come to see that this is part of my process. I start down one road, hit a bump, and turn in another direction. I’ve learned to trust this and know that in the end the work will be better for it. 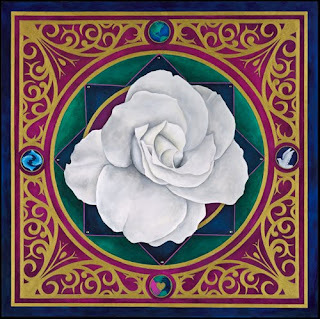 In the Christian tradition, the white rose is a symbol of the Virgin Mary. It represents reverence, purity, and humility. From an Eastern perspective, we might also call this egolessness. In the North, the earth element: This represents your love of the earth. In the East, the air element: The dove represents your want for peace. In the South, the fire element: The hands and heart represent your love/passion for your partner and community. In the West, the water element: The fish represent your astrological sign, Pisces. Inspired by the gold that is used in illuminated manuscripts, the gold creates a holy framework to hold each of your soul elements in a sacred manner.